Bentley: “This next story goes out to all of our cat friends. For the first time ever, the Los Angeles shelters Hero Dog Award is bestowed on a cat. Not just any cat though, this is one of the bravest cats that we’ve seen. Her name is Tara and she fought off a chow-mix dog that attacked her 6-year-old boy, Jeremy. He and Tara are best friends and spend most days hanging out together. When the dog grabbed her boy’s leg and began shaking him, she chased it away. Jeremy, who has autism, required eight stitches. The family knows that without the brave actions of Tara, it could have been much worse. You can see the entire scene here. Whoo hoo another great week in Blogville! Mom works from home mostly too, so no need for us to go anywhere. Bailie did spend a lot of time at the other office as a youngster, learning to behave properly, and Katie and I went to work every day in Germany. The office is fun occasionally, but working from home is better. Mom won't even take us for a walk if it is about 85 - it makes her so mad around here to see people with dogs out on 90 degree days taking their dogs for a walk in the middle of the day. OMC OMC THAT is one FANGTASTIC KITTY... BRAVO to TARA fur pawtecting her Boy!! Once again, a wonderful start to the week. 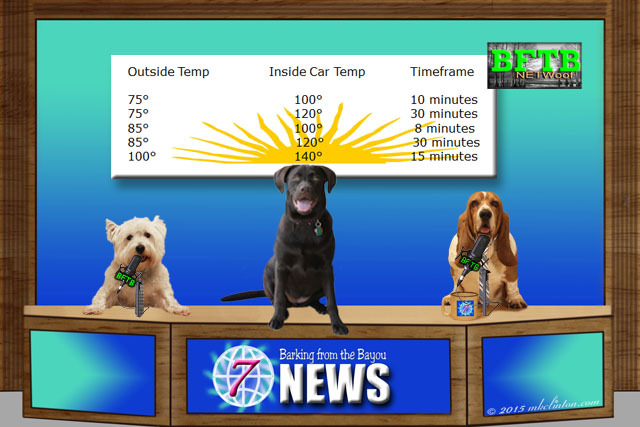 Yep, let's hope for no more dogs in hot car stories this year! we are supposed to be 105 by next week - way to warm to even be outside let alone ride in the car. Another great news post. That sure is a brave cat to fight off that dog. Great news report! We're so happy Tara won the hero award. Thanks for the reminder to keep dogs at home on hot days! It should go without saying, but too often people just don't think. Thank you so much for that temp chart, people so erk me when they take their dogs with them and only crack the window a inch. I saw somewhere's where they are trying to make it legal to bust out someones window if you see it. OMD, Tara SO deserves that awardie!!! I just can't gets enough of that video!! 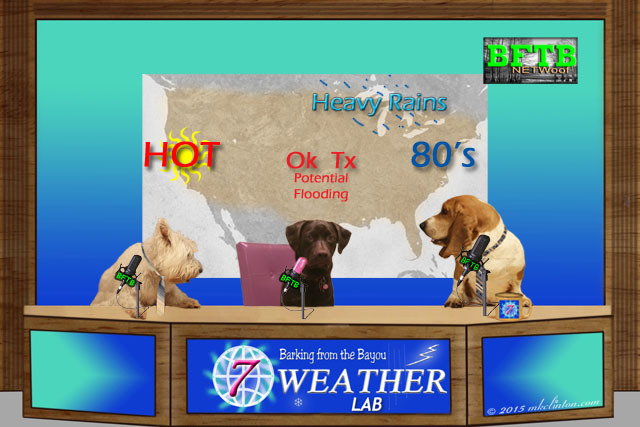 You guys, that heat chart is SO impawtent!!! Peeps forgets how HOT a car can get...even with the windows down! Ma always leaves my furry arse at home! I likes it, cause I can gets into stuffs I wouldn't be able to gets into with HER around...BOL!! Wow, that's one amazing cat! I hadn't heard about this story so thanks for sharing. I love that cat. I watched the video before and I was so happy that the kitty was there, because it definitely could have been a lot worse! Luke loves to go for rides, and he's disappointed if he can't go everywhere this time of year. But we always keep him safe at home when it's too hot, unless we have two people and one can stay in the car with him! Excellent news report boys, & Paisley! I'm glad you're warning people about HOT cars, it's such a big issue in Summer. That cat is so amazing and so brave!